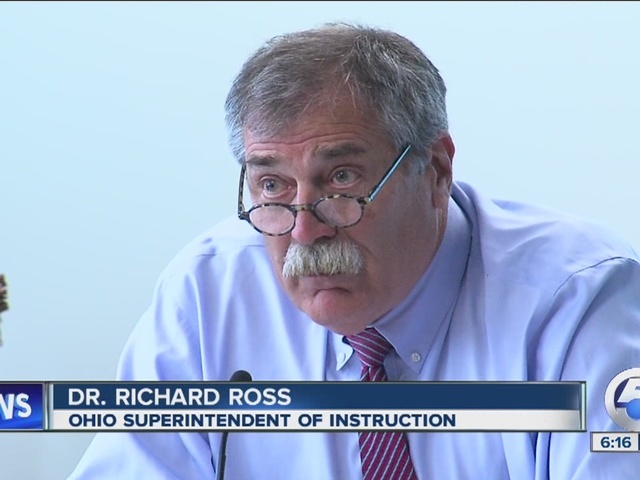 Ohio school board members grilled Ohio Superintendent of Instruction Dr. Richard Ross about the education department's charter school data scandal on Tuesday. Ross said he was unaware of a scheme to exclude online charter schools' failing grades from performance data. Ross said 100,000 records related to the incident have been turned over to the Ohio Inspector General's office and the state auditor's office. However, several board members called for an independent investigation during the school board meeting at the department of education. Ross said the employee responsible for leaving failing online schools out of charter school evaluations has resigned and he does not believe any current employees were involved in the manipulation of the data. "It's not appropriate. It's not acceptable," said Ross. He said the data-rigging scandal has "undercut" the state's efforts to improve its charter schools. Ross said he is creating a whistleblower policy to prevent future problems. Records show ODE employees expressed concern about the plan to exclude the data to the employee overseeing the project.